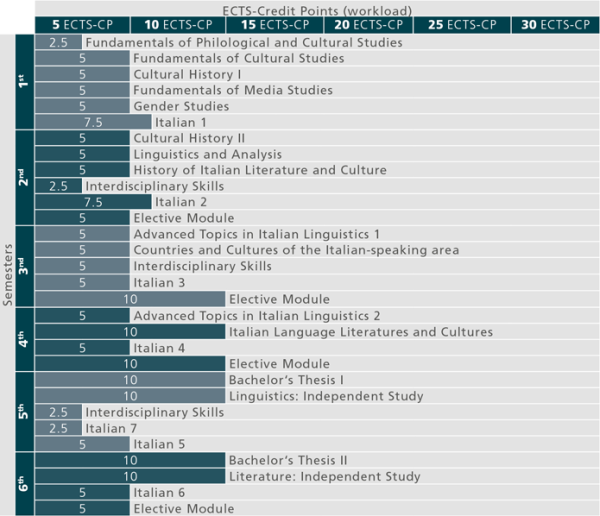 SL Fundamentals of Philological and Cultural Studies (CM1/1 h/2.5 ECTS-Credits). VO Introduction to Media Studies (CM 5, lit. a/1 h/2.5 ECTS-Credits). (2) Successful passing of all exams of the Studies Induction and Orientation Stage entitles to passing all further courses and examinations and to writing the Bachelor’s Theses. Command of the foreign language at level C1 based on CEFR, skills in text reception and text production, improvement of language skills by stays abroad (e.g. ERASMUS). Awareness for the structures of Italian as well as its functions and effects in different regional, social, situative and historical contexts. Critical discussion of texts of different origins (also film, chanson); awareness for the interrelations between culture and text. Awareness for political, social and economic aspects of Romance-language countries in their relevant historical context. Graduates are able to elaborate, evaluate and implement scientific developments in linguistic, literary and cultural fields and to apply them in interdisciplinary contexts. They possess scientifically well-founded theoretical and methodical problem-solving skills, interdisciplinary competences and soft skills. Based on the transfer of these competences and skills, graduates are prepared for a wide range of activities and careers in different fields: international relations, culture, media, public relations, translation, tourism, publishing, administration, economy, science.